The annual booklet covers the current environment of the Japanese electric power industry, and is presented in English. Topics in this issue include: latest energy policy developments, electric power market reform, renewable energy, nuclear power, GHG reduction, efforts of utilities and statistical information. 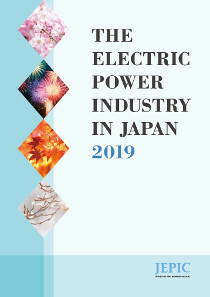 Related info:Booklet "The Electric Power Industry in Japan (EPIJ)" 2019 is now available for free download. Please contact us from here for purchase inquiries. - This publication was prepared by the Japan Electric Power Information Center (JEPIC), based on publicly available information. While we presume this information to be accurate and reliable, we provide no guarantee as to the accuracy of the data or information contained herein. JEPIC shall therefore assume no legal responsibility for any trouble, loss, or damages resulting from any actions taken based on the content of this publication. - All copyrights pertaining to this publication belong to JEPIC. Unauthorized reprinting of the content of this publication is forbidden, and unauthorized copying or reproduction is also forbidden, except in cases where this is allowed under Japan' s Copyright Act. - Questions and requests can be submitted here.